Where were you for the total solar eclipse of August 21, 2017? Annette and I, plus several visiting family members, were camping at Glendo State Park, 100 miles north of where we live in Cheyenne. Our campground was right on the centerline of the path of totality. After several days of swimming, kayaking, mountain biking, seeing the local scenery, and generally relaxing and enjoying one another’s company, Eclipse Day arrived. The weather in eastern Wyoming was perfect. It was a warm, sunny day with crystal clear skies. In and around the small town of Glendo (population 204), it was a people- and vehicle-choked madhouse. But where we were camped, a 25 minute drive around on the other side of the lake, all was calm and peaceful. There were groups of people here and there on the beach, in the campground, and on the ridgeline above it. We picked out a nice, sandy spot under a copse of trees on the edge of the wide beach. There we could enjoy the shade while we were waiting, and head out into the clear sun for the eclipse itself. We had been planning this event for nearly a year. Now it was time to sit back and take in the spectacle! I had read that people commonly have powerful emotions, even something like a spiritual experience, during total solar eclipses. Nah, I thought. That won’t happen to me. It’s simply a fascinating astronomical phenomenon! 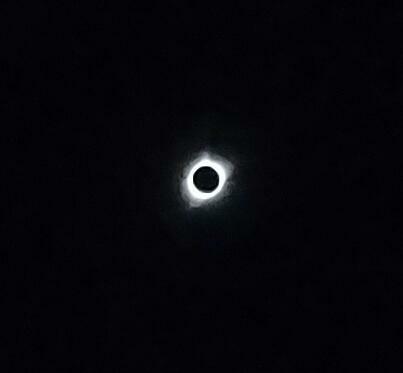 But truth be told, the moment of totality took me by surprise. I did indeed feel a rush of emotion. I felt myself choking up at the actual experience of seeing the sun, that constant light in the sky, completely blocked by the moon. I hugged Annette close to me. Meanwhile, other people down on the beach were expressing their emotions in a different way. There was whole lot of whooping and hollering! No one who experienced the eclipse first-hand could be unmoved by its power. Seeing that jet black disk where the brilliance of the sun usually is, the white rays of the sun’s corona streaming out on all sides, the darkened skies, feeling the rapid drop in temperature, watching a “sunset” that circled the entire horizon . . . . There is nothing to compare it to. No photograph or YouTube video can do it justice. There is no substitute for seeing and experiencing it in person. At our location totality lasted about two and a half minutes. That’s not a very long time. And yet, that two and a half minutes by itself was worth all the months of planning and preparation. Once totality was over, many people headed off to prepare for their departure, or go about their day’s activities. But we weren’t leaving until the next day. (Thankfully—it would have taken us many hours to get home in the bumper-to-bumper southbound traffic after the eclipse.) My daughter and I, and several other people down on the beach, donned our eclipse glasses, sat back in our chairs, and watched for the next hour and a half, chatting here and there, as the black disc of the moon gradually moved back across the sun until it was going . . . going . . . gone! And then it was time to get out of the hot sun! We had the rest of the afternoon and evening to get out on the kayak one more time, take a sunset bike ride on the gravel roads along the edge of the lake, and for my son and me, take one more spin the next morning on the spectacular mountain bike trails at Glendo State Park. Our trip home the next day was uneventful. Or it could have been. There was no traffic to speak of. However, an overheating engine and a stop at a mechanic shop in Wheatland provided one last adventure. But that’s a story for another time! Meanwhile, we had plenty of time to bask in the glow of our splendid eclipse party—and of the experience of the eclipse itself. Astronomers tell us that although all of the outer planets in our solar system periodically experience total solar eclipses, our total eclipses here on earth are special. First of all, we’re here to watch them! No other planet has thinking, feeling beings present to experience this amazing celestial phenomenon. But more objectively, our moon just happens to be about the same size as the sun in the sky. Although the moon is 400 times smaller than the sun, it is also 400 times closer to us than the sun. This means that it can produce total solar eclipses that just barely cover the full surface of the sun, providing the beautiful sight of the sun’s corona streaming out on all sides from the blackness of the eclipse. Even if we could stand on the gaseous surface of the outer planets, the eclipses just wouldn’t be as spectacular. That’s both because the sun looks smaller from those planets and because their moons are too big in the sky relative to the sun to produce the perfectly matched solar eclipses that we get here on earth. It just so happens that here on earth, where there are billions of humans to observe them, we have the most spectacular eclipses in the solar system! And as it turns out, even on earth, there won’t always be total solar eclipses. Meanwhile, it just so happens that by the time the first humans appeared on earth, and continuing on for the first billion or so years of our existence on this planet, we will be able to enjoy the spectacle of perfect total eclipses of the sun, just as we can now enjoy them somewhere on earth about every 18 months. Is it all a big coincidence? Is the powerful experience that millions of people had on August 21, 2017, really just a big coincidence? Is our life here on earth really just a big coincidence? Many secular scientists would have us believe that we humans on earth just happened to happen, through a series of colossal cosmological and biological long-shots. The Big Bang just happened to happen with exactly the right force to make galaxies, stars, and solar systems possible. Earth just happened to happen in just the right place around just the right size and intensity of star to make it possible for life to exist here. Earth’s Moon just happened to happen through a massive planetary collision so that we have the ocean tides that coaxed early sea-dwelling creatures out onto land. Thinking, feeling, self-aware human beings just happened to happen through astronomically unlikely evolutionary processes that could have produced entirely different creatures. And the most spectacular total solar eclipses in our solar system just happened to happen right here on earth, where we spectacularly unlikely human beings could experience them, and be unexpectedly struck by the vast wonder of our small life in this vast universe. Sure, it could all just be a vast cosmic coincidence. Our very existence, and the powerful, moving experience of August 21, 2017, could all just be the result of random chance hitting it exactly right on this one planet out of the trillions of planets in trillions of solar systems that we now know are out there in this incredibly huge universe. However many other inhabited planets there may be out there in all of that vastness, I don’t believe ours came about merely as a result of some vast cosmic coincidence. I believe that there is a greater Love and Wisdom out there, Who provided this vast universe precisely so that people like us could look up one day as the moon covers the sun, feel our heart rise to our throat, and wonder about the Love and Wisdom that created all of this spectacular vastness—and each one of us in it. I also traveled to see it. We went about 500 miles to southern Idaho. The area is very flat, so you can see this amazing sunset in all directions during the totality. I was not emotionally moved, but it was probably the coolest thing I’ve ever seen. It was like the Sun turned black. I thought I would be able to see the Moon, but no, that’s not at all what it looks like. It looks like a hole in the sky with light on the rim. And it felt eerie too. Temperature dropped about 10 degrees in that two minutes. If I had no knowledge of such a thing and was just out in my fields working, a solar eclipse would be the scariest two minutes of my life. It would be the most emotional and spiritual thing to ever happen to me. But since I do know what it is, it becomes a marvel, not an omen. Glad you were also able to see the eclipse with clear skies. And yes, it’s just like a hole in the sky where the sun usually is! And it wouldn’t surprise me if earlier humans who thought of the sky as a dome overhead thought that’s exactly what it was: a hole in the dome of the sky where the sun is supposed to be. Good for you on having been able to witness such a momentous occasion! While some sense of it was available to any of us with a sky overhead, being able to view it in its totality is a truly privileged experience indeed. I’m wondering, though, of things like eclipses have any relationships to the science of correspondences? Events like eclipses are more tricky to evaluate in those terms, because, again, they’re more ‘events’ than ‘things,’ but is there any correspondent meaning to derive from them? From what I know about the basics of correspondence, though, the idea of something interfering with the sun’s rays from reaching us doesn’t sound like one with positive connotations! You probably won’t be surprised to hear that in the few places Swedenborg mentions eclipses in his theological writings, their connotations indeed are not good. He uses them as a metaphor for human evil blocking out the light and warmth of the spiritual sun—i.e., the Lord. However, it is a general principle of correspondences that everything has both a positive and a negative meaning. When eclipses have a negative meaning as just mentioned, it is when the sun is taken as a positive metaphor standing for the presence, love, wisdom, and power of God as it flows into us. Perhaps that’s why some people have a spiritual experience when they experience a total eclipse of the sun. One of the beauties of correspondence theory is that it depicts the nature of the created world in such an expansive light. The created world is not merely *for* us, but it’s also *about* us- the spiritual story of humanity is itself built into the material universe. I also think it’s important that you mentioned the positive sides to otherwise negative correspondences. I recall reading in Swedenborg’s accounts of correspondence that wolves, for instance, correspond to evil predatory behaviors, but obviously we aren’t to regard wolves themselves as evil, nor are we to treat them disdainfully because they correspond to evil. On the contrary, they’re magnificent creatures that serve as vital a role in our natural world as do animals which have positive correspondence. Not to tread too deeply into the subject of correspondence on a subject that wasn’t posted for it, but something I’m trying to understand, on that note, is what does is it mean that we have a natural world- a good world- that operates according to both good and evil correspondences? Everything across the entire spectrum of correspondence is necessary for our world to operate in the way that it does. Does that mean that evil is in some way necessary? Would we have no wolves or eclipses if humans weren’t fallen? As I’m sure you’re aware, this is a tremendously complex and tricky subject to tackle. I made a stab at it in an article that I know you’ve read before, but you might want to read it again with your particular question in mind: “How can we have Faith when So Many Bad Things happen to So Many Good People? Part 2.” Section 2 of Part 2, “Violence, pain, and suffering exist in the universe because the universe was created for us,” is my go at threading the needle of evil correspondences in nature when nature itself is not evil. I’ll add that this is one area where I believe we need to update Swedenborg’s science based on our greater knowledge of ecosystems and environmental biology. Swedenborg generally subscribed to the traditional view that predatory animals are “evil” and represent evil things spiritually, while gentle and domesticated animals are “good” and represent good things spiritually. He makes statements to that effect at various points in his theological writings, including saying that “evil” animals and noxious plants came into being as a result of the Fall of Humankind described symbolically in the early chapters of Genesis. This we now know cannot be correct. The predator/prey relationship, as well as spiny and poisonous plants, existed long before human beings first began to walk the earth. And we also know that the predator/prey relationship is integral to a balanced, healthy ecosystem. Swedenborg does make mention of this mechanism as well, so he wasn’t totally in the dark ages scientifically. But he simply didn’t have the level of scientific knowledge about how the animal and plant worlds work that we have today. An any rate, the section I mention in the article linked above lays out my current thinking on this subject. If it still leaves unanswered questions, feel free to continue the conversation there. I’ve always wondered if there was a spiritual significance to eclipses, the way they’re so perfect and all. Maybe that’s the point though; that all these improbabilities just don’t add up to mere coincidence.. I wrote a few things about the spiritual significance of eclipses in my reply to Rami just above. But I do think that the sheer power of the experience has its own force and meaning, apart from any specific symbolism or correspondence of the phenomenon. At least, that’s how I experienced it! You’re from Wyoming? That’s pretty cool, especially because it’s the least populated state! I’ve always wanted to visit. Yes, Annette and I moved to Cheyenne two years ago. We like it here! If you ever do come this way, drop me a line and we’ll arrange to get together for a visit. Holy cow, was that eclipse really a little less than a year and a half ago? Somehow it feels like it was much longer ago *and* much more recent than that. It does seem as if it were a lot longer ago than that. Then again, a lot has happened since then—for me, anyway—so that’s not so surprising. Physical time may be regular and constant, but psychological time varies all over the map depending upon our state of mind.